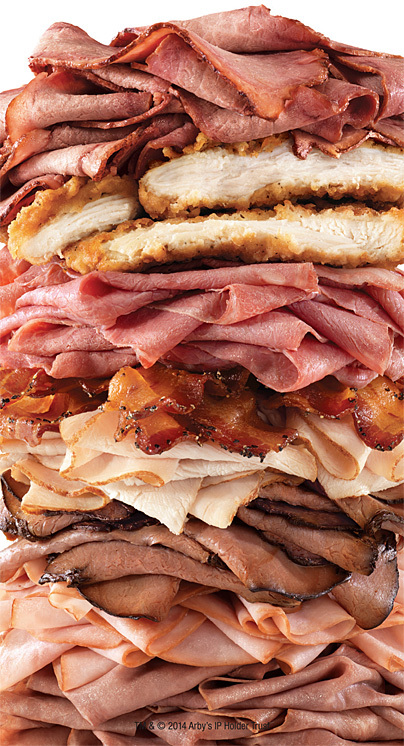 In Praise Of @Arbys Denali-Style Meat Mountain Sandwich: Have you tried it? Arby’s promotional image of their “Meat Mountain” sandwich, a “secret menu,” hand-made custom sandwich which contains every meat and cheese offering they carry. …but it’s NOT listed on the menu! In a manner of speaking, it’s been somewhat “under the radar” except to a few with specialized knowledge of it. It’s like a word-of-mouth menu item. Apparently, it’s been around for quite some time, at least two, and very nearly three years – at least since August 2014. Store associates will make it for customers who ask for it by name. If you like bacon, ham, pork sausage, barbecue, ribs, or any other pork product – including cold cuts & pizza – get ready to pay at least 2 – 4 times more, and for shortages. Wall Street minions – who manage Smithfield, an American company no more – have no patriotic qualms about taking food off your table and out of your mouth to feed the mouths of the people who steal our nation’s military secrets, defraud our motion picture & music copyrights, and have an historical track record of Shanghai-ing anyone & everyone who gets in their way. You think I’m kidding, or that I don’t know what I’m writing about? Just recollect back a few months – oh, say about 7 – to Thanksgiving in November 2012 when pecans were 2x – 3x the price they were usually. After all, pecan farmers had a record bumper crop… and that typically translates into lower prices for consumers. It’s because the Chinese suddenly discovered they liked pecans, and were willing to pay premium prices (translate: much MORE then you’re willing to pay), and so the growers shipped pecans over to China. As I continue to contend, IT’S ALL ABOUT THE MONEY. Okay… so it may cost more. So what? Were you aware that the Chinese company that bought Smithfield sold pigs that had been fed a substance banned in the USA & England & other nations? Shuanghui Group, China’s largest meat processor, sold pigs fed Clenbuterol in 2011. Here are three links about the ordeal. And, would it surprise you to find out that Goldman Sachs is one of the top investors? Shuanghui International Holdings Ltd., China’s biggest pork producer, agreed to acquire Smithfield Foods Inc. (SFD) for about $4.72 billion to boost supplies for the nation that’s the biggest consumer of the meat. Closely held Shuanghui, parent of Henan Shuanghui Investment & Development Co. (000895), will pay $34 a share for the Smithfield, Virginia-based producer, both companies said today in a statement. The offer is 31 percent more than yesterday’s closing share price. China’s consumption of pork is rising with the expansion of its middle class while there are questions being asked about the safety of the country’s food supply. Smithfield’s livestock unit is the world’s largest hog producer, bringing about 15.8 million of the animals to market a year, according to the company’s website. It owns 460 farms and has contracts with 2,100 others across 12 U.S. states. Following is a repost of an earlier entry of mine hosted at another location. This morning as I awakened, I had set the alarm for 0630 in the thoughts that I might attend the 0800 worship service. I was awake until around 0100 watching a DVD series of MI-5 episodes. It’s a BBC production, and a fine television series at that! As I watch their productions, I am coming to think that they are superior in their story telling to many of these made-in-Hollywood Americans.